The MCP1630 and MCP1631 offer another method that can be used to generate high speed PWM signals for high power LED drivers. The MCP1630 is an 8-pin device that contains the components needed to generate an analog PWM control loop, including an error amplifier, comparator and a high current output pin to drive a power transistor. 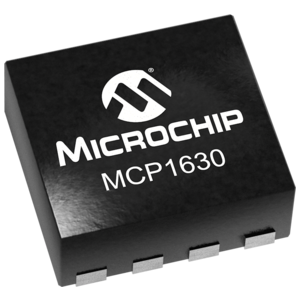 The MCP1630 is designed to be used with a MCU that provides a reference clock source. The MCU controls the PWM frequency and maximum duty cycle. The switching frequency can be up to 1 MHz, depending on the application requirements. The MCU can also control the reference input for the error amplifier when dimming or soft start functions are required. 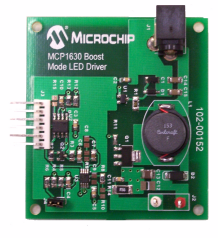 Multiple MCP1630 devices can be attached to a MCU to support multiple power channels. The MCP1630 can be used to solve advanced power supply issues. When multiple MCP1630 devices are used, phase offsets can be applied to each clock input to reduce bus current ripple. For applications that are sensitive to EMI, dithering can be applied to the clock signal to reduce radiated energy at a given frequency. The MCP1631 is a 20-pin device which, in addition to the MCP1630 includes an internal 5V or 3.3V regulator, shutdown control, overvoltage protection, oscillator disable and 1x and 10x gain amplifiers.